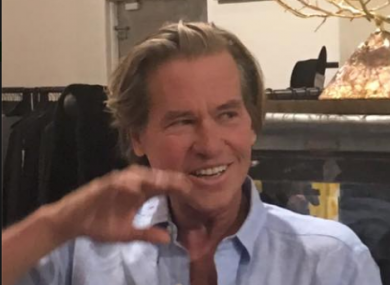 HOLLYWOOD ACTOR VAL Kilmer has been forced to deny he has cancer after Michael Douglas claimed he was suffering with the disease and the prognosis wasn’t good. Last week, Douglas told a crowd during a Q&A session in the UK that Kilmer had withdrawn from public life due to his illness, Sky News reported. He said: “Val was a wonderful guy who is dealing with exactly what I had, and things don’t look too good for him. But Kilmer said he is fine and hadn’t spoken to Douglas in over two years. In a statement, Kilmer said: “I love Michael Douglas, but he’s misinformed. The last time I spoke to him was almost two years ago, when I asked him for a referral for a specialist to get a diagnosis for a lump in my throat. Some fans have mistakenly thought my silence about my personal issues meant that somehow I wasn’t being responsible to my health, because of my reliance on prayer and love. Nothing could be further from the truth. “Whatever led Michael Douglas to speculate about my health, he’s a loving and devoted friend to a privileged group of talent people around the world, and I’m sure he meant no harm. Email “'I love Michael Douglas, but he's misinformed': Val Kilmer speaks out on cancer claims”. Feedback on “'I love Michael Douglas, but he's misinformed': Val Kilmer speaks out on cancer claims”.